Taikan, Yokoyama (born Sakai Hidemaro), 1868 – 1958, Japanese painter. 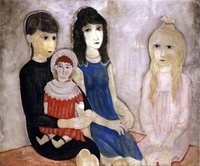 "Summer", 1940. (From the series: Four Seasons at Mount Fuji). Pigment on paper, 75 x 110 cm. Yasugi, Adachi Museum of Art. 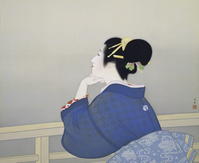 Uemura Shoen 1875–1949. "Eine Frau wartet auf den Aufgang des Mondes" (Jungverheiratete Frau, auf einem Geländer lehnend und zum Himmel blickend), 1944. Hängerolle, Farben auf Seide, 73 × 86 cm. Yasugi, Adachi Museum of Art. JAPAN: BOSHIN WAR, 1868. 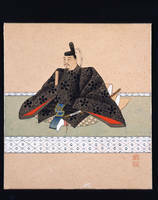 Acting independently, Yamaoka Tesshu, vassal of the Shogun, rides from Edo to meet the Emperor's forces under Saigo; he successfully proposed the attack on Edo be postponed until a peace conference could be arranged. 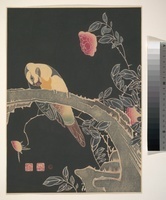 Woodblock print, triptych, 1891, by Toshiei. The Wind God. 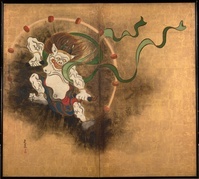 Right part of two-fold screens 'Wind God and Thunder God' by Korin, Ogata (1658-1716)/ Tokyo National Museum/ Early 18th cen./ Japan/ Watercolour and ink on paper/ The Oriental Arts/ 181,8x164/ Mythology, Allegory and Literature. The Thunder God. 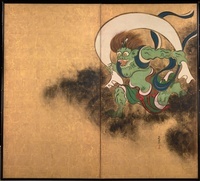 Left part of two-fold screens 'Wind God and Thunder God' by Korin, Ogata (1658-1716)/ Tokyo National Museum/ Early 18th cen./ Japan/ Watercolour and ink on paper/ The Oriental Arts/ 181,8x164/ Mythology, Allegory and Literature. 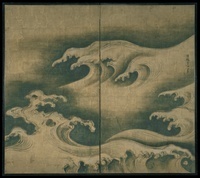 Yokoyama Taikan 1868窶・958.窶彜ea Breeze窶・(Seebrise), 1935.Hﾃ､ngerolle,Tinte auf Papier, 76 ﾃ・110 cm.Yasugi, Adachi Museum of Art. 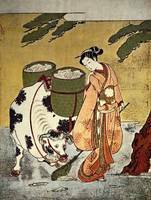 所蔵: 根津美術館 Ogata Korin (1658 – June 2, 1716) was a Japanese painter of the Rinpa school. He was born in Kyoto, son of a wealthy merchant who had a taste for the arts. Korin also studied under Soken Yamamoto, the Kano school, Tsunenobu and Gukei Sumiyoshi, and was greatly influenced by his predecessors Hon'ami Koetsu and Tawaraya Sotatsu. Japanese,c. 1600.Handcraft depiction (dye works).Section from a painted screen with presentations of handcraft.Kita-in, Saitama. Japanese,c. 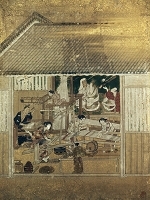 1600.Depiction of handcraft (Paper manufacture).Section from a painted screen with depictions of handcraft.Kita-in, Saitama. Japanese,c. 1600.Dye works.Section from a painted screen with depictions of handcraft.Kita-in, Saitama. Japanese,c. 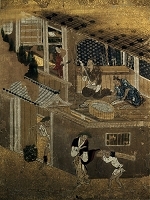 1600.Sword grinding workshop.Section from a painted screen with depictions of handcraft.Kita-in, Saitama. Japanese,c. 1600.Weaver at stool.Section from a painted screen with depictions of handcraft.Kita-in, Saitama. Japanese,c. 1600.Manufacture of armour.Section from a painted screen with depictions of handcraft.Kita-in, Saitama. 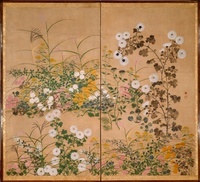 Artist： Korin, Ogata (1658-1716) Title： Six-panel screen depicting Cranes, Edo Period (ink, colour, gold & silver on paper) Location： Freer Gallery of Art, Smithsonian Institution, USA Medium： ink, colour, gold and silver on paper Description：Each panel measures 166x371. See 491620 for pair. 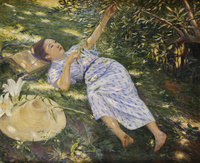 Tomioka Eisen 1864-1905. Print, ca. 1896-1916. Meiji period (1868-1912). 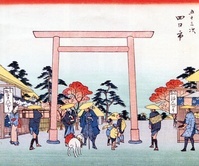 Polychrome woodblock print; ink and color on paper, 21.9 × 31.4 cm. Inv. Nr. JP3196 New York, Metropolitan Museum of Art. 作家名：伊藤若冲 ( 1716年 - 1800年 ) 国籍： 日本の絵師 ジャンル： 日本画 年代： 江戸時代 Ito Jakuchu 1716–1800. Woodblock print, ca. 1890–1910. 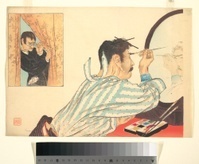 Meiji period (1868–1912)./Polychrome woodblock print; ink and color on paper, 25.4 × 34.9 cm./Inv. Nr. MJP14/New York, Metropolitan Museum of Art. 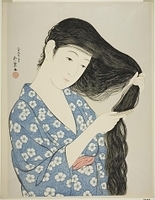 Identifier : AKG5048146/Museum/New York, Metropolitan Museum of Art image date : 1.1.1890/Time Period/19TH CENTURY/20TH CENTURY/2ND MILLENNIUM A.D.
Hashimoto Kansetsu 1883–1945. “Autumn Farm”, 1939. Hängerolle, Farben auf Seide, 51 × 65 cm. Yasugi, Adachi Museum of Art. 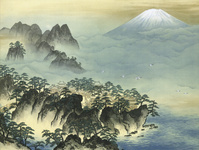 Tsubaki Chinzan 1801-1854. Hanging scroll, ca. 1801-1854. Edo period (1615-1868). 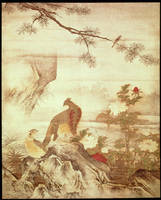 Hanging scroll; color on paper, 141 × 37.1 cm. Inv. Nr. 1975.268.115 New York, Metropolitan Museum of Art. 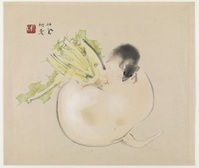 Tani Buncho 1763-1840. Illustrated books, 1809. Edo period (1615-1868). 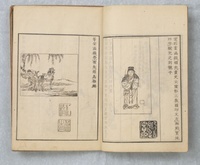 Eight woodblock printed books; ink and color on paper, 23.5 × 15.9 cm. Inv. Nr. 2015.300.225a-h New York, Metropolitan Museum of Art. 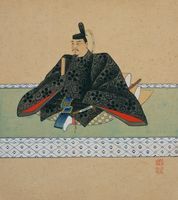 Tani Buncho 1763-1840. Hanging scroll, ca. 1763-1840. Edo period (1615-1868). 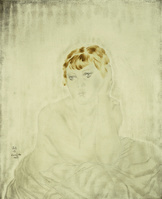 Hanging scroll; ink on silk, 91 × 21.6 cm. Inv. Nr. 36.100.2 New York, Metropolitan Museum of Art. Hashimoto Kansetsu 1883–1945. “Dogs from Europe” (Europäische Hunde), 1941. (Windhunde). Diptychon, in je zwei Felder unterteilt, Farben auf Seide, 164 × 183 cm. Yasugi, Adachi Museum of Art. Tsukioka Settei 1710-1786. 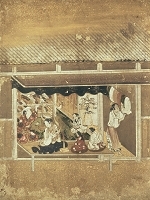 Shirabyoshi Dancer and Female Servant; Courtesan and Girl Attendant, Screen, ca. 1734-1766. Edo period (1615-1868). 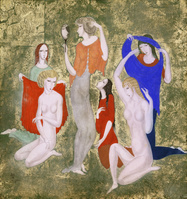 Hanging scroll paintings, remounted as a two-panel folding screen; ink, color, and gold on silk, 114.3 × 41.9 cm. Inv. Nr. 2015.300.116 New York, Metropolitan Museum of Art. Korin 1658-1716. Cranes, Pines, and Bamboo, Folding screen, ca. 1671-1699. Edo period (1615-1868). Pair of folding screens; ink and light color on paper, 167 × 257.2 cm. Inv. Nr. 1975.268.62, New York, Metropolitan Museum of Art. 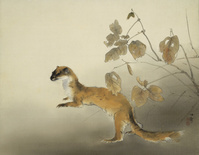 作家名：伊藤若冲 ( 1716年 - 1800年 ) 国籍： 日本の絵師 ジャンル： 日本画 年代： 江戸時代 Ito Jakuchu 1716–1800. Print, ca. 1890–1910. 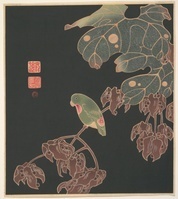 Meiji period (1868–1912)./Polychrome woodblock print; ink and color on paper, 25.4 × 36.8 cm./Inv. Nr. MJP13/New York, Metropolitan Museum of Art. Identifier : AKG5048147/Museum/New York, Metropolitan Museum of Art image date : 1.1.1890/Time Period/19TH CENTURY/20TH CENTURY/2ND MILLENNIUM A.D.